Income Tax department has released the New Income tax forms for the Financial year 2018-19 assessment year 2019-20 vide notification 32/2019 .However the E-filing of this forms is yet to be started on Income tax india Efiling site. At present this forms have only academic interest and to consume changes proposed in it. as the most of the persons are required to file return through online mode only. 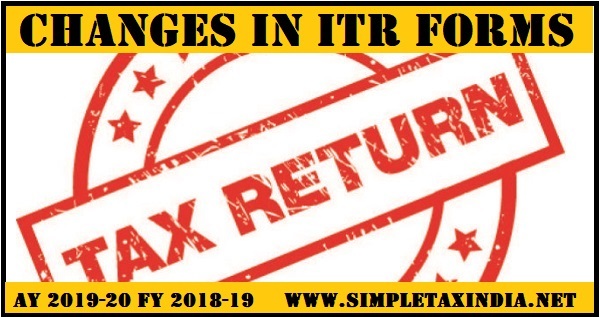 Not many major changes has been introduced in this forms except few which are required due to change in laws from last year like addition of column for standard deduction for salaried persons which has been reintroduced from financial year 2018-19. Furthermore details has been sought regarding foreign assets. For landlords: For TDS relief, landlords will have to quote the PAN card of the tenant. They will also have to list the period of stay of the tenant. This will apply to individuals who earn from rent and file ITR-2. Those getting money in the form of donation would have to give details of the name of donors, their address and PAN. Taxpayers having an agricultural income need to file ITR-2 with details of the and, the name of the district when he owns the land and the PIN. They will also have to share details of the ownership of the land, whether it is irrigated or dependent on rainwater. The tax department has stopped investors and company directors from filing ITR with Sahaj and Sugam forms. In ITR-6, taxpayers would have to share details of money in foreign accounts, equities and bonds. 1. Short title and commencement.__ (1) These rules may be called the Income-tax (Second Amendment) Rules, 2019. (c) in sub-rule (5), for the figures “2017”, the figures “2018” shall be substituted. Note.- The principal rules were published in the Gazette of India, Extraordinary, Part-II, Section 3, Sub-section (ii) vide notification number S.O. 969(E), dated the 26th March, 1962 and last amended by the Income-tax (First Amendment) Rules, 2019, vide notification number G.S.R. No. 76(E), dated 30th January, 2019.